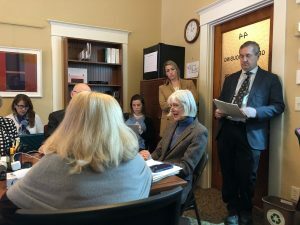 Joyce Manchester, a Senior Economist for the Vermont Joint Fiscal Office, testified before the House Committee on General Housing & Military Affairs regarding the estimated cost of implementing the proposed mandatory, government-run Paid Family Leave program. The total estimated annual price tag is $106 million. This number does not include start -up costs, and is potentially underestimating the ongoing administrative costs, perhaps significantly. David Simendinger, president of Champlain Farms, which operates thirty-six convenience stores in Vermont, testified following Manchester. He was blunt, saying, “This has the potential to bankrupt us.” Simendinger further noted that there is no incentive in the bill to encourage someone who takes advantage of the Paid Leave program to return to work when the money runs out. Simendinger speculated that if this passes, on day one there will be a lot of employees out there figuring out how to game the system so that they can spend six weeks of summer caring for a “sick relative” while receiving 100% of their salary at taxpayers’ expense. Invite AOC to help with the transition to capitalism to socialism. Help turn light to darkness. If you can’t run a business without family leave you simply have to business running a business. All banks should immediately Block all loans for a new business if it dose not provide some family leave . And dose not pay enough for local rents . What are you the devil? This is 2019 last time I checked . Your business plan your long time goals are dependent on your trement of your employee’s . What you would not let you4 son and daughter working there not get the same plans . What exactly is wrong with you? I am not a bit surprised that more people want another way to get paid for not working. It seems to be a virus going around. It brings to mind something I read in the 90s. I was given a paper copy then, but others have put it up on the internet. Here is one: https://www.nationalgunforum.com/jokes-section/8755-not-raising-hogs.html#/topics/8755. ” a liberal state that is ostensibly looking out for the poor”, ‘ostensibly’ being the operative. The wacky Ocasia-Cortez factor at play. These people don’t care about the poor or anybody else. This is all about redistribution of wealth. But then who needs AOC when we have Leahy, Sanders and Welch, the dregs of the Congress right here already? Rob, Unfortunately, the major problem with Joyce Manchester’s expert testimony is that it exposes just how flawed Tom Stephens’ stimates are and therefore she will be politely ignored. As in the past, only those supporting an issue hold sway. I wonder if I should take business advice from a residential counselor.